When you arrive at an airport to find thousands of skiers in slow-moving queues, think of all the similarly cramped flights that are taking off, all the pollution caused, and endure tedious transfers at the other end, do you ever ask yourself: "Isn't there a better way of getting to the slopes?" The mountains are wonderful – who wouldn’t want to be there? 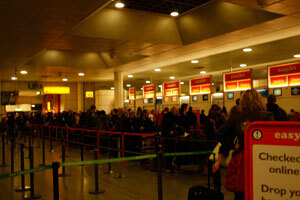 The journeys to reach them - by plane - are a nightmare. But on the trip to Sauze, something changed. Slumped against the coach window on the final approach to the resort village, I noticed something glinting in the sun down the hill below us. I just made it out to be a railway track before it disappeared from view as the coach rounded a bend. It just struck me: one of those light-bulb moments when you start wondering if something amazing is possible. I’d been told, ‘Don’t be silly, of course we can’t go by train’, but there it was, a railway track right here, a few minutes from the resort. So maybe – just maybe - it was possible. 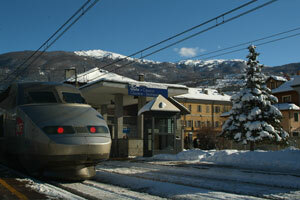 The tourist office told me there was a station only a few minutes away – Oulx. They had no idea how long it would take from London, but just knowing trains came here was enough for me. Back in the UK I dug out an old European rail timetable from my parents’ attic – a relic of a student Inter-rail trip years before. Incredibly, London to Oulx required only two trains – one a direct TGV from Paris – and, door-to-door, was almost as quick as flying. How many other resorts could be reached easily by train? No-one seemed to know, so I started researching. I got a map of Europe and began ploughing through the timetable, plotting possible routes. It was like putting together a jigsaw puzzle where you didn’t know what the pieces looked like, but just knew the final picture would be worth it. And the more I searched, the more I discovered. 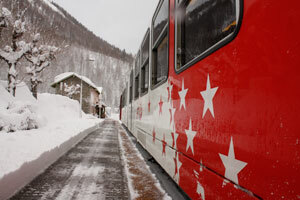 Plenty of resorts in France, Switzerland, Austria, Italy - even Andorra – could be reached by daytime or overnight train. I persuaded my skiing friends to let me plan our next trip by train. It was a gamble. What if the journey didn’t work out as planned? It would be my fault. Yet there was no way I was going to be herded through airports for the rest of my skiing days without at least giving the train a go. The moment the Eurostar slipped quietly out of Waterloo, my fears melted away. Eyes twinkled, banter flew across the train table, scenery slid by. Our holiday had already begun. We kept travelling that way. Sometimes we travelled by day, sometimes overnight, dreaming like kids about the snowy slopes that awaited us. If the journeys took a little longer than flying, the enjoyment made them feel shorter. And in resorts, people were always curious or envious when they heard we’d come by train. We had something here. A few years later, when I started working as a journalist, I wrote a travel feature for The Guardian about how to reach ski resorts by train. Soon I was writing articles like this two or three times a season, for Ski+board, The Daily Mail, The Observer, Daily Mail Ski&Snowboard and others. But each time the journey research remained a total pain – even for the train geek that I was rapidly becoming. These travel articles provided inspiration to skiers, but once someone wanted to find out exactly how to book and make a journey, they were in for a frustrating time. There was no one place to get the information. You had to ring different train companies, bus operators, taxi firms. A study by environmental charity Mountain Riders had found that 73% of a ski resort’s carbon emissions result solely from transport of holiday makers to the resort – dwarfing the emissions generated by hotels, ski lifts and snowmaking etc. Train travel produces a fraction (around 10-15%) of the equivalent journey by plane or car. Skiers were generating huge amounts of carbon in reaching the slopes, yet little was being done to help them travel more sustainably. With more than a million journeys taken each year from the UK to European ski resorts, I knew that changing the way we got there could make a real difference. Clearly, what was needed was a rail-to-resort website. Researching and creating such a site would take time and money, but I was hopeful that if I could convince ski resorts and national tourist offices of the benefit, they would contribute some funds. I ran the idea past some key industry people. Go for it, they said. We launched in October 2009 with fantastic backing from the ski industry and travel media for which we are hugely grateful. In our first season more than 22,000 skiers visited the site. This season – with more resorts coming on board - we’ve helped tour operators and rail companies join forces to create nearly 4,000 rail-inclusive ski packages at preferential rates – making it even easier for skiers to book. We’re working to keep making the site more useful and to help the ski industry create better rail options for skiers. The really satisfying thing is that if we’ve spent hours – or even days - researching a particular journey and can then tell other people about it, we have saved them all that time and frustration, and maybe opened up a possibility to them that they wouldn’t even have known about. The ski industry has been ‘business as usual’ for too long without seeing ways to take significant environmental steps. Sometimes you have to be the first to stick your head above the parapet and ask ‘what if?’ That is when real change happens. We have now begun to make a difference. The rest of the story remains to be written, with your help. snowcarbon began as a glimpse of a railway track. Now it is becoming a shared vision by skiers and snowboarders who know that how they travel to the mountains does make a difference.